What kind of obi do Oiran and tayu wear? They seem a little plump? like a comferter of something! But i was just wondering that. And does anyone know the names of the musubi they tie or how to tie one?? Must be pretty hard. One more question: Are the kimono worn by oiran any different from regular ones? They wear hikizuri? And the padding looks humongous! Do they add extra padding for their kimono?? Sorry if any of these have been previously answered. From what I've seen, there are no obi that are made like them these days. You're right, they're quite plush in the photos and Very wide. I would think that photos would be your best guide. The same goes with the musubi- I would doubt that there are any tutorials, so getting something that looks like the pics would be about the best you could do, I think. You might be able to get the same look without making it complicated. I know that they wore multiple collars to make it look like many layers sometimes. Also, remember that at the time of the tayu- or oiran (can't remember which came second), that many kimono were made hikizuri because they were worn indoors like this- not just by dancers. So, oiran wore layers of the kimono that would have been worn at the time. many times it looks like they're wearing hikizuri tomesode, to me. SHort-sleeved uchikake is definately an option, also. basically, you really can't compare how they wore their kimono to how it's worn today, because you take it out of perspective of the time period. Yes, their clothes were outrageous and extravagant, but they didn't really wear them too differently than most women of the time. Mostly the amount of layers, embellishment, and obi was different. that's just what I've observed. I'm no expert! The difference with uchikake is not in how they are worn - as all uchikake are worn open over the top of kosode and trail on the ground, but in the motifs which separate them from being wedding uchikake or regular uchikake that used to be worn by women of wealth or class back in the day. In relation to the padded hems of the kosode - she's a courtesan...who does everything in excess - look at the hair, the hair accessories, the size of the obi, etc. It isn't surprising or unusual at all that she would have the hems of her kosode padded excessively. Another point of interest is that people tend to forget that the way the ohashori is worn in modern day kimono is still a relatively new change in the scope of kimono wearing history. Wearing kimono in the modern manner does not allow for a heavily padded hem, unless, of course, it is a hikizuri in question. In the past, many women of wealth in addition to geisha and courtesans (merchant wives, daughters, samurai wives, daughters, etc etc) wore trailing kimono inside and while this seemed to have started going out of vogue in late Meiji, I've seen many photographic and illustrated instances of all sorts of women from Meiji era and earlier that have had padded hems on regular kosode...some slight padded and some heavier padded. I've also seen instances of women who are obviously not geisha, courtesans or brides wearing three layers of kimono that is worn to trail and all three layers having moderately padded hems. The Costume Museum refers to the padded layers worn by the Edo period Shimabara tayu as nakagi ("middle clothes"), with each layer being called aidagi. Although I feel that this has been answered within this thread...clearly there is need for the finest details. The differences between a uchikake and kosode are based in the fabrics chosen as well as the lining, a uchikake lining is complete and full, no hakake, as in a kimono for closure. Like trying to understand the differences between a hon-furisode (kakeshita) and a maiko hikizuri and a dance susohiki, the differences are slight....all kimono are based on the use of a tan bolt, so the construction is reasonably the same for one to the other. So, to answer you question - a definition of a uchikake is a kimono outerwear garment, often made of heavy fabrics and in modern wear made of fabrics that are of fabric of near obi weight. the lining of the garment is generally red and full from top to bottom. it is worn only at formal occasions presently, however it was a common garment of choice for the women of the samurai class. I would like to point out that I am not an expert on this garment, so please, those who know more...add or correct my definition. if those kimono were fully lined they would be uchikake? 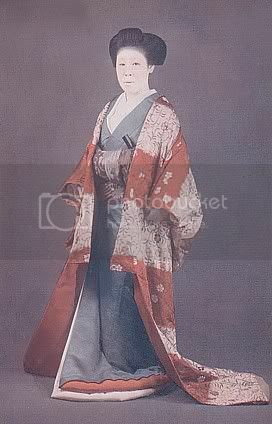 You cannot always apply what's true for modern kimono to older kimono such as what the tayu is wearing. Meiji uchikake were not exclusively made from obi-weight fabrics as many modern uchikake seem to be. They were also made from chirimen, rinzu, shushu, and other varities of silk. Some were fully lined, while others had momi (a type of light, gauzy silk) doura with a heavier silk hakkake. Futhermore, those kimono worn by the tayu would never be worn as uchikake (outer robe worn open), so it's pointless to ask "what if." It's like asking if giving a homongi a full lining and wearing it over something else would make it an uchikake.